This low-fat, made-from-scratch family favorite, is a good source of calcium from the cheese. And as a bonus, this comfort-food classic can fit into a healthful eating plan. Melt butter in large saucepan on low heat. Remove half of butter; mix with bread crumbs. Set aside. Stir flour and salt into remaining butter in saucepan; cook and stir 1 minutes. Gradually stir in milk until well blended; cook and stir until thickened. Add Velveeta and 1 1/2 cups cheddar; cook until melted, stirring frequently. Stir in macaroni. 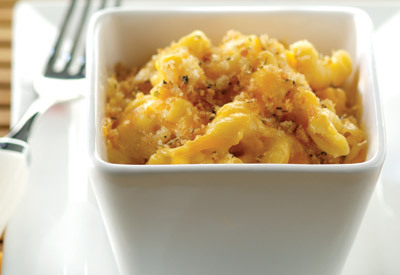 Spoon into 1 1/2- quart casserole; top with remaining cheddar and buttered crumbs. Assemble recipe as directed. Refrigerate up to 24 hours. When ready to serve, bake at 350 degrees F for 30 minutes or until heated through.